An estimated 120,000 children living in the UK without legal immigration status are at risk of destitution, exploitation and social exclusion because of contradictory and frequently changing rules and regulations which jeopardise their access to healthcare, education, protection by the police and other public services, a new report published today by the University of Oxford shows. 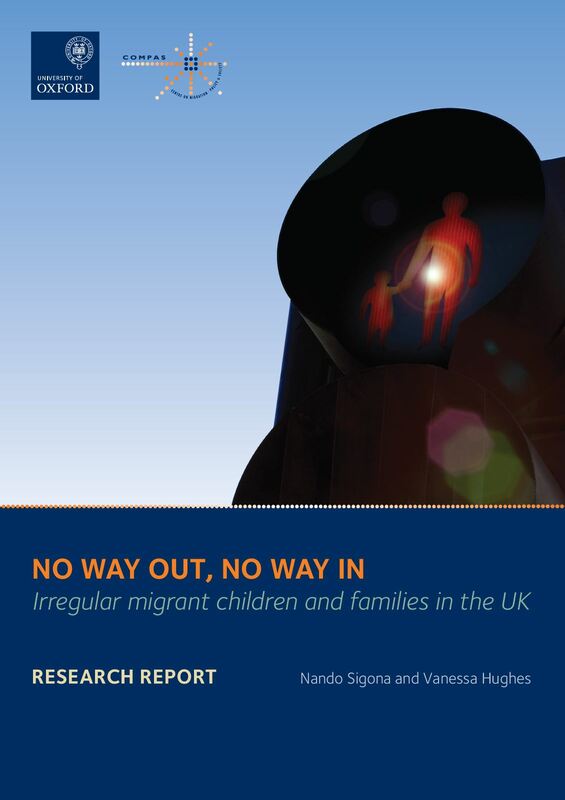 The report “No Way Out, No Way In: Irregular migrant children and families in the UK” is published by the ESRC Centre on Migration, Policy and Society (COMPAS) at the University of Oxford. It shows that irregular migrant children – more than half of whom were born in the UK and have lived here their entire lives – are being trapped between laws protecting children and the enforcement of migration control. Dr Nando Sigona, the report’s main author, said: “Current immigration policy seems to override the concern for children’s rights. Nobody, not the public, nor the children or their families, benefits from this”. Both international and British laws guarantee children access to education and healthcare, irrespective of their immigration status, and oblige public authorities to work in the children’s best interests. But increased demands on public authorities by the UK Border Agency – such as asking social services to report suspected irregular migrants – are pushing families and children away from essential services, leaving them more vulnerable and isolated. This can also mean that children and their families who are victims of serious crime may be afraid to report it to police because of their fears about their immigration status. Frontline professionals like GPs and teachers are increasingly being asked to check the legal status of children in their care. Not having legal status can mean the children either don’t go to school or can’t participate fully. It also means they may not be able to register with a GP or that pregnant mothers who lack legal status may avoid antenatal and postnatal care for fear of being reported to UKBA. Dr Paramjit Gill of The Royal College of General Practitioners stated: “Having a large group of young people without access to healthcare has significant public health implications such as missing out on routine immunisation and screening programmes”. Dr Sigona said: “The point of the report is to identify the situation that these children are in, and the difficulties that this places on the public service providers with whom they come into contact. Teachers, GPs and social workers should be allowed to do their jobs without having to act as de facto immigration control officers”. Through a vivid portrait of children’s everyday lives, the report shows the profound extent to which the immigration system can affect the health and educational achievements of irregular migrant children from an early age, and seeks to contribute to the policy debate on how to reconcile the protection of children’s rights and migration control for the benefit of both the children and British society more broadly. Ilona Pinter, Policy Advisor on Young Refugees and Migrants, The Children’s Society said: “This research shows the harsh reality facing tens of thousands of undocumented migrant children across the UK. Denying families access to support and vital services is leaving children hungry, homeless and destitute. Regardless of their immigration status, the government has a responsibility to protect all children in the UK”. Finally, considering that children who were born or spent most of their childhood in the UK are unlikely to be deported, and the potential negative impacts on British society of a long term excluded population, the report recommends policy makers to provide effective pathways for irregular migrant children to regularise their legal status. The study was carried out by a research team at the ESRC Centre on Migration, Policy and Society (COMPAS). It was funded by the Barrow Cadbury Trust and was part of a comparative research project in collaboration with the Institute for the Study of International Migration (ISIM) at Georgetown University (USA). The research team conducted their qualitative study over two years, interviewing 49 irregular migrant families from Jamaica, Afghanistan, China, Brazil, Nigeria and ethnic Kurds reaching in total over one hundred minors, and carrying out 30 interviews with public service providers (teachers and GPs), local authorities, policy makers and support organisations. Dr Nando Sigona, the main author of the study, is Research Associate at the ESRC Centre on Migration, Policy and Society (COMPAS) and Senior Research Officer at the Refugee Studies Centre,both at the University of Oxford. His main research interests include: irregular and child migration, asylum in the EU, Roma politics and anti-Gypsyism in Europe, and the relationship between migration, citizenship and belonging. Vanessa Hughes is Research Assistant at the ESRC Centre on Migration, Policy and Society where she contributes on a number of research activities and projects on irregular and child migration, migrant integration in the EU, citizenship, and urban change. This entry was posted in resources, voices and tagged age disputing, asylum, big society, Birmingham, child detention, child migration, children, Chinese, education, England, family, healthcare, immigration control, immigration policies, irregular immigration, Jamaica, Kurdish, London, migrant voices, super-diversity, UK-born children to irregular parents, undocumented migration. Bookmark the permalink.